Growing up in Laos, Chanhpheng Sivila contracted polio at the age of 3, which affected her leg and spine and made walking difficult. When it came time to go to school, her parents wouldn’t let her attend, telling her they couldn’t afford a school uniform for all 12 of their children. But Chanhpheng was determined to get an education. Defying her family’s reservations, Chanhpheng decided one day to steal her big sister’s old school uniform and then secretly followed her to school. Her boldness paid off. The teachers at school saw Chanhpheng’s determination and convinced her parents to let her attend. The 4-foot-7 Chanhpheng battled her way through school and eventually went on to earn a bachelor’s degree from the National Academy of Politics and Public Administration in Vietnam and a bachelor’s degree in business administration from Rattana College in Laos. She refused to let the stigma of having a disability get in her way. 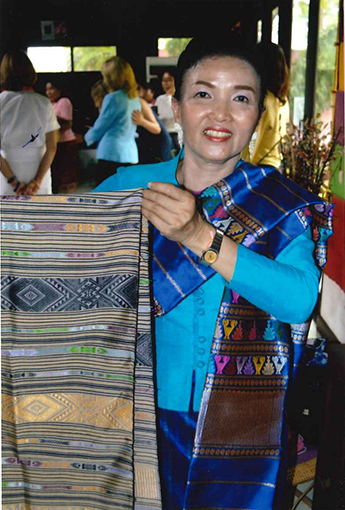 In 1990, Madam Chanhpheng founded an organization that became the Lao Disabled Women’s Development Centre. She is now a tireless and inspiring advocate for the rights of women and girls with disabilities. As Madam Chanhpheng’s center celebrates 25 years of empowering women and girls with disabilities in Laos, the United States is celebrating the 25th anniversary of the Americans with Disabilities Act. This landmark legislation guarantees rights of individuals with disabilities in the United States. It also serves as model legislation informing disability rights internationally, including in many of the countries where USAID works today. The law’s principles of access, inclusion and non-discrimination are woven into USAID’s own Disability Policy, which promotes the inclusion of persons with disabilities across all of our programs. I recently accompanied Second Lady of the United States Dr. Jill Biden on a trip to Laos and Vietnam. On the trip we saw some of USAID’s efforts to give children and youth with disabilities access to education as well as workforce development training. Dr. Biden recognized the Lao Disabled Women’s Development Centre for its work educating and empowering young women in Laos over the last two and a half decades. Each year, the center provides basic education, life skills and job-related training for 35 young women. Since 2002, over 500 young women with disabilities have graduated from the center. Our delegation visited a reading class and a papermaking demonstration, and then we bought scarves woven by the women in the program. The center benefitted from a USAID grant given to World Education Laos through the Senator Patrick Leahy War Victims Fund; the fund primarily helps individuals with disabilities in conflict-affected countries. 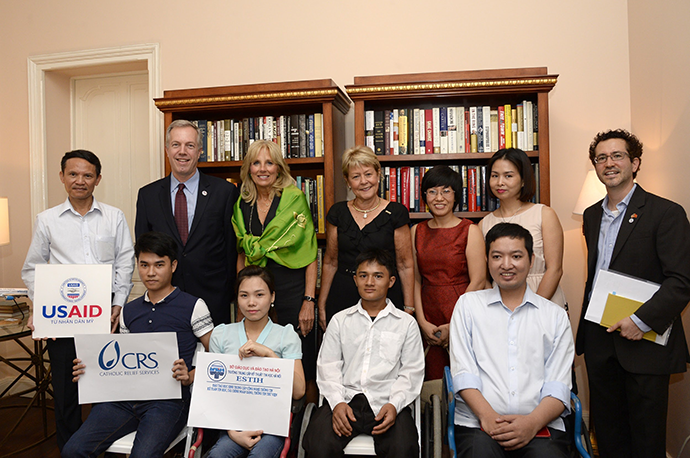 While in Asia, Dr. Biden and I also visited students from the Hanoi College of Information Technology in Vietnam, where USAID has collaborated with Catholic Relief Services since 2007 to provide advanced computer skills training to over 700 youth with disabilities. About 70 percent of the program’s graduates have found jobs; a few have even found their life partners in the class and have plans to marry. The U.S. Government has supported inclusive development programs in Vietnam for the last 25 years, even before normalization of diplomatic relations in 1995. According to UNESCO, most children with disabilities in developing countries are out of school. The problem isn’t that they don’t want to be in school or that they can’t afford it. The reason is often negative and discriminatory attitudes, like those faced by Madam Chanhpheng, combined with physical barriers. USAID is committed to finding new strategies to reach people with disabilities. Earlier this year, our All Children Reading Grand Challenge for Development awarded funding to five organizations for their low-cost, technology-based solutions to promote literacy for children with disabilities. They are developing and implementing these reading technologies over the next two years in Georgia, India, Lesotho, Morocco and the Philippines. Another major obstacle to addressing the out-of-school issue is the lack of data on children and youth with disabilities. A great first step would be to gather data on the numbers of children with disabilities in and out of school, disaggregated by type of disability. This would help us to know who is being left out of the education system and allow us to study the barriers in order to plan effective interventions. The data would undoubtedly be telling, but we will also need to open our minds to what is happening behind the numbers. By learning from people like Madam Chanhpheng, we will be better positioned to steer the agenda for educating children and youth with disabilities. Christie Vilsack is the Senior International Education Advisor at USAID. Follow her @ChristieVilsack.